Douglas Fir is one of the best known timber producing species in the world. In British Columbia (B.C. ), Canada, there are two varieties of Douglas Fir—coastal and interior. The coastal variety occurs along the southern mainland coast and across Vancouver Island. The interior variety is found throughout southern and central B.C. Douglas Fir is a large tree reaching heights of 85 metres on the coast and 42 metres in the interior. 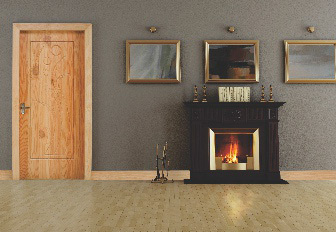 Douglas Fir is seen as a first-class wood for the manufacturing of sash, doors and windows. The wood is also used for a wide variety of products including general millwork, furniture, cabinets, veneer, vats, ship and boat construction, transmission poles and marine pilings, and for structural purposes including laminated arches and roof trusses. Structurally it is used in the form of lumber, timber, piles and plywood. Douglas Fir is commonly used for building and construction purposes due to its extraordinary strength-to-weight ratio and availability in large dimensions. 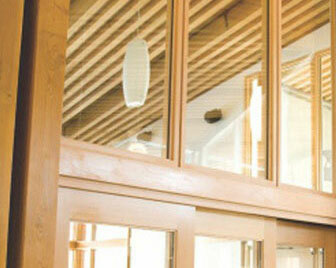 In India, it has been used in post and beam construction and is highly recommended for solid doors and door frames. What is the difference between coastal and interior Douglas Fir? Coastal Douglas Fir is a much bigger tree than interior Douglas Fir. The timber from the coastal region is generally lighter in colour and more uniform in texture than that grown in the interior. One of the main differences is that interior Douglas Fir is less permeable to preservative treatments. Besides the mentioned properties the two varieties have the same wood properties. Douglas Fir has excellent strength properties and is well known for its workability. The wood dries rapidly with small dimensional movement and little tendency to check. It is relatively easy to work, with good machining qualities. It turns, planes and shapes well and can be sanded to a smooth finish. The wood glues easily, has good nail and screw holding ability and takes a good finish.